A group of eight former pupils of the Moseley School of Art from the same year got together for a small reunion one wintry Sunday afternoon in January, 2002 at a pub in Halesowen, near Birmingham. Those eight were Lynne Bryant (Venables), Madeline Teague (Bolas), Paul Sankey, David Lord, John Yeomans, Michael Holloway, Tony Teague and myself, Graeme Collins. With one or two exceptions, none of us had seen each other for 40 long years. The afternoon was spent getting to know each other again, lowering the barriers and asking the inevitable questions "Did you hear about . . . ", "I wonder where so-and-so is now? ", "Does anyone know what happened to . . . ", and . . . . "Have you seen the state of the school?" We were all perturbed that the fine school building had deteriorated to such an extent, and we exchanged theories and possible explanations about how this situation could have come to pass. The general belief was that the building had been empty for some considerable time, and we all wondered what state of dereliction there must have been throughout the interior of the building. We all agreed that we had spent a marvellous three (or four) years at the school nearly half-a-century before, and half-heartedly resolved to see what could be done. 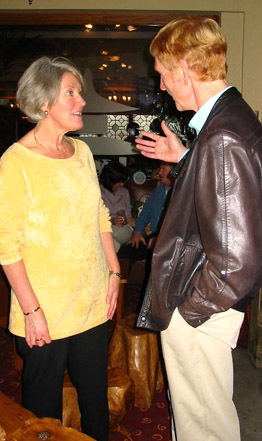 Lynne and I spoke about organising a 'proper' reunion with a larger number of people, and we chatted about the possible methods that might be used to trace colleagues from our own and other years. After outlining a few of the factors that would constitute a popular reunion, Lynne eventually suggested that I should "Carry on and organise something . . . ". The FriendsReunited site proved to be a very good place to start and e-mail circulars were immediately sent to subscribers from all of the years listed on the Moseley Art School section (there were then three sections devoted to our school under different names, which have now all been consolidated into a single section), and began the process of building our contact database. It was, however surprising that a large proportion didn't reply, preferring to either ignore e-mails or, perhaps more likely, maintain their anonymity as silent readers. Corresponding with people via the FriendsReunited site has proved to be far more difficult than direct e-mail as FR will only allow individual (rather than "batch") e-mails to be sent. All former pupils and teachers are encouraged to forward their contact details to us at this site so that we can include them in block e-mails. Sending e-mails to former pupils via the FriendsReunited site is an extremely arduous process, so those ex-pupils who haven't provided their personal e-mail address direct to us will not receive any further e-mail correspondence. Former pupils should also ensure that we have their correct Email address - we've already lost touch with a large number of people who've changed their e-mail address without telling us - after it took us forty years to find them ! A new Reunion was arranged for Sunday, 17th. March 2002. The last-minute hitch caused by larger than expected numbers meant that we had to organise an alternative venue, and John Yeomans booked us in at the Kings Highway Pub, Halesowen. We arrived at the venue to find that a few keen former pupils had already arrived. There was a very special tension in the atmosphere . . . hopes and expectations were high, and everyone mixed without hesitation, feeling that we were all bonded by the same experience of having attended our unique school. As the numbers grew, we experienced time and again the meeting of people who had been close friends but hadn't seen each other for thirty, forty, fifty, sixty and more years . . . people being reintroduced, then searching each others eyes for recognition . . . floods of memories pouring back through the mist of time. It was a very emotional experience for the pleasing total of 74 people who attended the reunion, many having travelled from all over the country to be there. A good number of people brought along items of work they had created during their time at the school, and we were reminded of the precocious talent that was common among the young teenage pupils at our unique school. 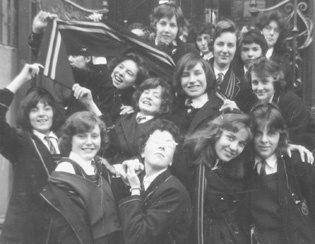 For most of us, it was the first time we had seen a school cap or tie, blazer badge, gymslip and sash, or enamel Prefect badge for decades. Several productive contacts were made at that meeting with people whose positive support continues to help us to develop the Association. The number of people on our register had increased from 8 to 74 in just two months, and, with virtually everyone asking what was going to happen next, it was realised that we had only exposed the tip of the Moseley Art School iceberg. 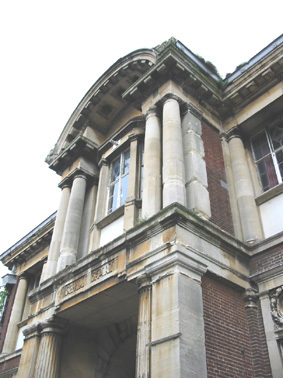 The Art school building is a Listed Building classified Grade II (Star) which means that it is important enough to enjoy international architectural significance. A conversation with the Birmingham City Council Conservation Officer failed to help me understand how such a gem of Birmingham architecture could have been allowed to fall into such a disastrous state of repair, and I decided to consult the owners. I arranged a meeting at the school with Mr. Javed Arain, the Vice President of the British Association of Muslims, a registered charity, who purchased the building from the City Council in 1980, and I invited John Yeomans to join me. Following a brief conversation with Mr. Arain, we were invited to enter the building and have a look around. Exploring the inside of the building made it readily apparent that a tremendous amount of work has been done on refurbishing the interior of the school to its original condition following four years when the building was, apparently allowed to stand empty. The water table in the Lime Grove area is very high and it was necessary for a pump to run constantly to maintain the basement free from flooding. On vacating the building, the power supply was apparently cut which permitted the basement to flood to waist height, allowing the basement to remain flooded for a period of four years. By the time the building was sold by the Council the whole of the basement and ground floor timbers had been severely attacked by floodwater. During the drying-out process, the building became severely damaged by Dry Rot, which nearly caused the terracotta-tiled foyer floor to collapse into the basement. Far from being depressed, I left the building two hours later lifted by having my fears about the interior of the school dispelled. After years of assuming, like everyone else, that the building was derelict, it was found that the interior has been completely refurbished. The basement is the last area of the school to be refurbished, and was still undergoing building works at the time of our last visit.It was a tremendous experience to freely roam the empty old building again, recalling the odour of cabbage rising from the basement, the smell of red carbolic soap and the solvent odours from Butchers Transfers next door, the cocktail of smells in the metalwork room - gas, flux, gilding metal and pickling acid, the taste of Spangles, distant echoes of the school bell (why wasn't I ever nominated to ring it at lunch time? ), the clatter of feet in the corridor, the tapping of planishing hammers, the voice of 'Ma' Squires taking some unfortunate girl to task, and the voice of 'Harry' Adams shouting at us for running in the corridor. Above all, I was amazed that the interior of the school actually seemed much larger than I remembered. Mr. Arain was very accommodating during our meeting and readily understood our concerns. We spent some time exchanging observations from our respective viewpoints, following which Mr. Arain agreed to the concept of a reunion meeting to be held at the school building. Nearly 4,000 e-mails and a lot of 3am finishes later, the Big One Reunion at the Moseley Art School was held on Sunday, 23rd. June 2002. Hundreds of adult people crammed themselves into a building that only used to hold around 300 kids. All of the former pupils of the Moseley School of Art know that they are part of a unique group of people who were selected to attend a unique school - an institution that generated young people who went out into the world with an unmistakeable sense of creative energy that didn't, in every case translate directly into the various fields of employment in the visual arts or crafts, but nevertheless ensured that the individuals would take a very creative attitude to their chosen field of work. 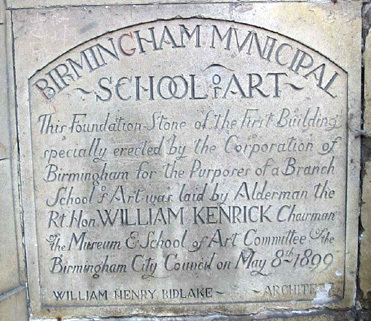 I had heard of people organising school reunions that had resulted in disappointment and loss of interest, but I was absolutely confident that anyone who had attended Moseley Art School (and still had a pulse) would want to return to our school to see if that special synergy was still there. People travelled from all over the U.K., Canada and Australia to be with us and they were still turning up as Wendy and I were leaving at the end of the day. It would have been worth all the time and hard work that went into the Reunion to have had just one high spot but, in the event, there were so many we lost count. Wendy and I, John and Jackie, David Lord and Anna, Mike Richardson and Annie were all exhausted by the end of the day and returned to our homes basking in the afterglow of feeling that the Reunion had been a success. To meet dozens of people we had known again and to meet former teaching members Jack Taylor, Ted Mason and Bob Ashby after all those years . . . . and I learned later that another teacher, Alan Rees had also been present . . . . an amazing afternoon. I'm used to public speaking, but it was slightly unnerving to have to ascend the stage to address an audience of around 400 people and when I did - after a number of deliberate delays, and then making sure that Jack Taylor accompanied me for support - the applause was so deafening that the people from downstairs rushed up to find out what was happening. I wish that everyone could have had the pleasure that we had of looking out at a sea of hundreds of bright expectant faces, all with beaming smiles, glowing with the warmth of people joined together by a common shared experience. I suggested during the address that we should formalise things to ensure that we didn't lose touch with each other again, and asked for an endorsement for the idea that I should progress matters as Chairman, and proposed the election of John Yeomans as Honorary Treasurer. There were no other proposals and both motions were carried unanimously. Mr. Javed Arain, the Vice President of the British Association of Muslims, was invited to reply to the comments I had made about his generosity, and it was afterward announced to a very appreciative audience that he had given permission for the school to be used for a three-week period in the early summer of 2003 for another mass reunion . . . and an exhibition of works by former pupils of the school. to promote the activities of members who are active in any of the fields of Art and the Crafts by means of publicity, sponsorship and procurement of artist materials at advantageous rates. It was added that the objectives may be modified or extended from time to time as provided for in the Bye Laws which will form part of the Constitution. During the discussion which followed, it was suggested that our objectives might be expanded to include a stimulus for art education for children. Further discussion suggested that this might be a way of reciprocating the generosity of the British Association of Muslims in allowing us to use the school. It was agreed that the draft objectives would be accepted subject to accommodation of the above if felt necessary following further discussion. It was explained that the Constitution will detail the management structure of the Association, and that the Constitution would also address the matters of elections, Annual General Meetings, membership grades, finance and the possibility of acquiring charitable status at some future time. The necessity for a membership fee was explained, although this item was not formalised. It was emphasised that one of the greatest problems was that of communication with former pupils who have no e-mail facility, and that I was personally meeting all costs at present, including postage, telephone, stationery, ISP and website hosting charges. It was resolved that the matter of subscriptions should be referred to the Hon. Treasurer, who had not been able to attend the meeting due to holiday commitments. Progress with contact with former members was briefly discussed, and the contact list (including those contactable solely via the FriendsReunited site) then stood at 684. I requested volunteers to act as 'Year Representatives' and 'Deputy Year Representatives', acting as the focus of communications for their particular year. The idea was accepted readily and a number of volunteers offered their names. We're lucky to have a large number of positive members who are doing a good job as Year Reps. I would have to say that Tony Wattis (1958) and Jan Williams (Cox) (1960) are 'naturals' - and Pat Freeman (Greaves) is so keen that she's taken on TWO years - 1969 AND 1971 - but even Pat's generosity is outdone by Ivan Haycock, who left the school himself in 1944, volunteered to take care of the leavers from the 17 years between 1928 and 1944, but has now retired. Our membership continues to grow as more ex-pupils discover this site on the Internet, as well as finding contact through the FriendsReunited site. Above all, though, the Association thrives because of personal contact . . . which is where our Year Representatives come into their own. Some of them initiate gatherings of ex-pupils from their own year every now and again - a large number of our years have had their own Lunches, Dinners, Parties etc. The role of the Year Representatives is straightforward, involving contact with only the other people from their Leaving Year ( average 10 - 20 people ) to make sure that they are aware of meetings and anything else that's happening, and trying to build on our numbers. Year Reps are especially important regarding members who have no e-mail facility - they can quickly begin to feel isolated and lose touch. No part of this website may be reproduced, transmitted or stored in a file retrieval system without obtaining prior explicit permission from the author, who retains intellectual copyright..